Phase 1 entailed launching the vessel after replacing shafts (post-sale) and have the props trued. 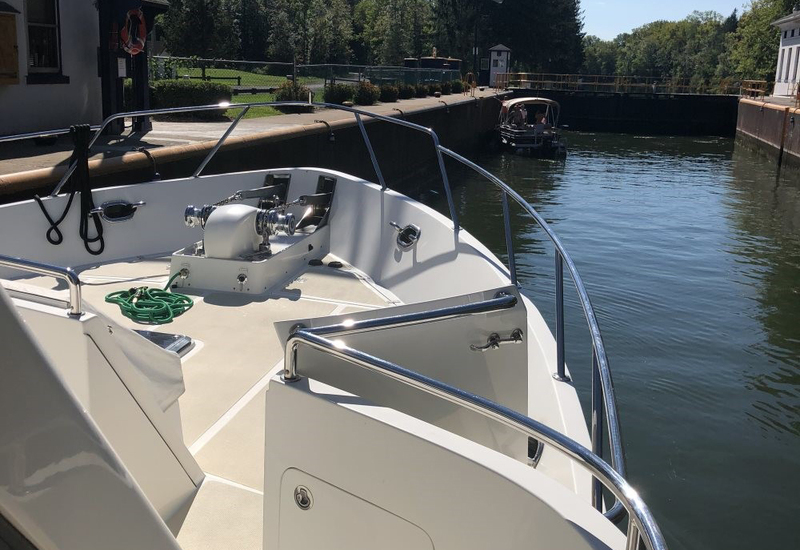 As the route included the Erie Canal, everything above the hard top needed to be removed; FLIR, radar and arch, SAT TV and GPS sensors giving us 20'4" of clearance. The normal pool level in the Erie has a clearance of 20' but my research found that the lake levels are down and we should have no problem. 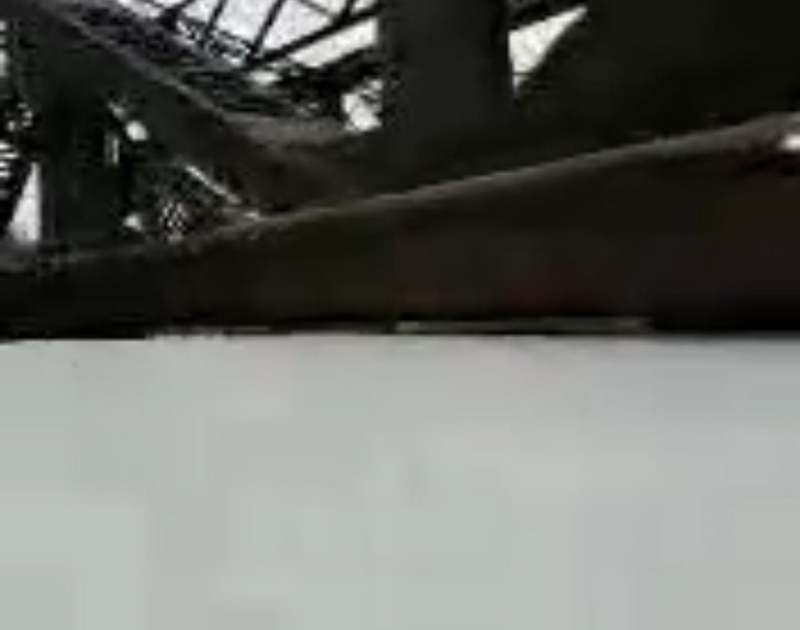 As it turned out, at Waterford we cleared the railroad bridge by 2 inches. 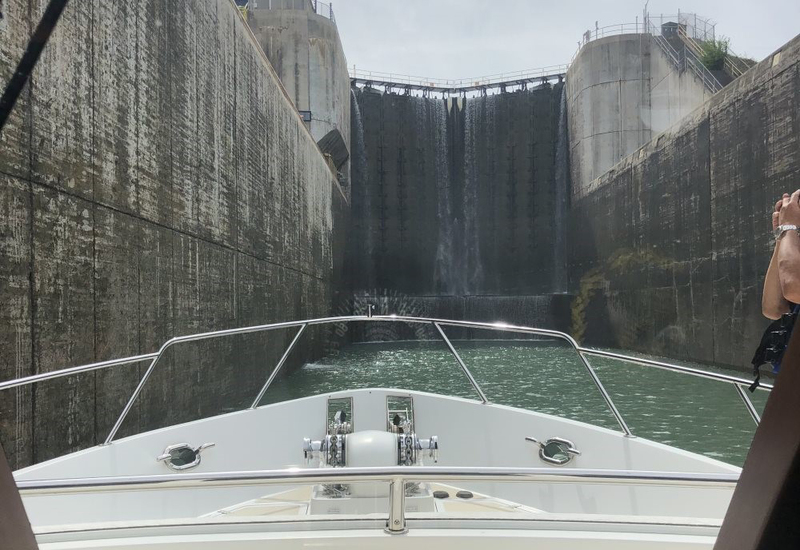 Once we cleared Waterford, it's a three day run with 22 locks to Oswego, NY. With a speed limit of 10 MPH, the scenery is spectacular. 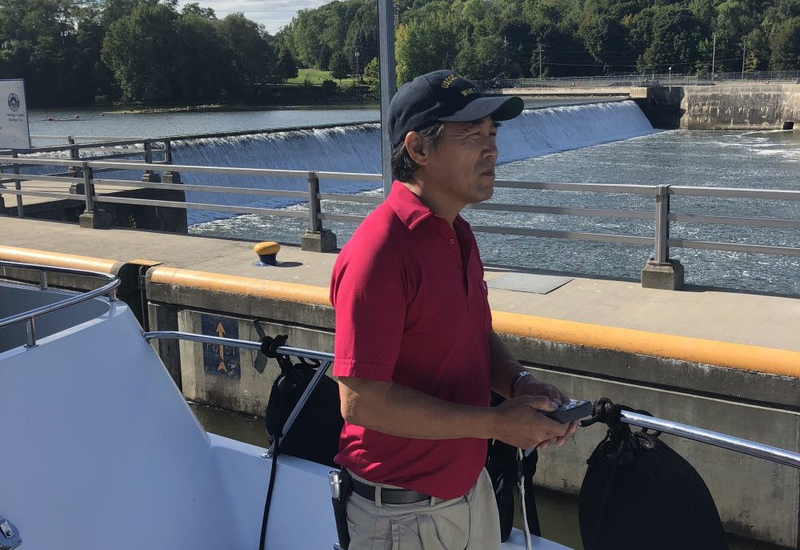 I had the new owner aboard for this leg and was able to give him hands on training of lock operations. My First Mate, Mike of Gallup, NM, served with me in the USCG while we were posted in Hawaii, 43 years ago. Mike was "deck force" and I was "engineering." This was Mike's third delivery with me and we work together like the team we once were. Here, Mike also get's instruction with locking using the yacht's remote controls. Well done, Mike. Overnight stops on the Erie Canal are in quaint little towns like Phoenix, Little Falls, Liona. You can usually find a restaurant or pizza parlor a short walk from the boat. Like clockwork, we arrived at Oswego NY, the terminus of the Erie Canal at Lake Ontario. Oswego Marina has a gin pole that is used to step sailboat masts for sailors transiting the canal. This came in handy for getting the radar arch back up on the hard top. It is in Oswego that we bid the new owner a fond farewell as he heads home. Mike and I head non-stop to St. Catherines, Ontario Canada arriving at 2200. Quick call to Canadian Customs and we're cleared. A call to The Seaway Corporation announces our arrival for locking thru the Welland Canal. We are instructed to be at the canal's "small boat dock" at 0700 and wait for instructions. Now it should be noted that on dozens of other transits of the Welland, I have made it thru in as little as 8 hours and by as much as 14 hours. Neither of these numbers were even close! Since last I was here (5 years), the Seaway Corp. has automated the lock system from a central command center. They fired all of the line handlers and when a yacht transits thru, they send a couple guys/gals in a pick up truck to the first lock and toss two lines. Once you transition to the next lock (there are 8), the couple drives to the next lock; which can take 20+ minutes. But the real delay comes from yachts being at the bottom of the food chain. 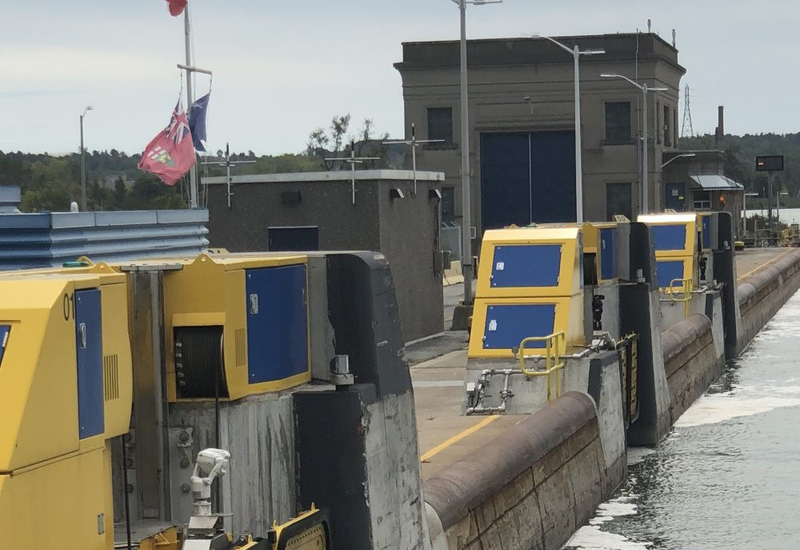 The St. Lawrence Seaway may be Canadian, but it's operations are managed and run by a three shipping company conglomerate with commercial shipping given top priority. On this delivery, my wait until first lockage was 27 hours!! Add to this the transit time to do all the locks and it was 35 hours to go 27 miles and exited Port Colborne just before sunset. 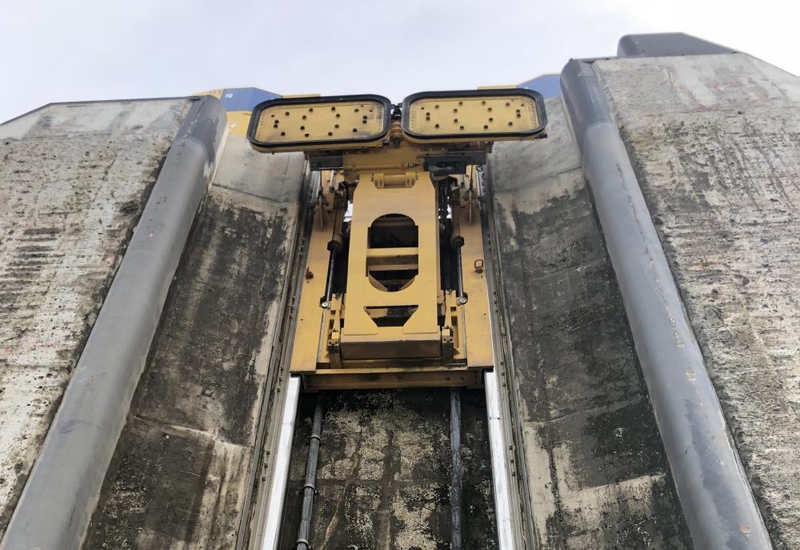 As part of the Seaway's automation, each lock has three giant "suckers" that latch onto the hulls of the Great Lakers holding the ships in place while they ride up/down the lock. Mike and I ran all night and most of the next day on placid Lake Ontario until we reached Put-In-Bay in the Bass Islands late afternoon. Cleared back into the US using the new CBP ROAM system. 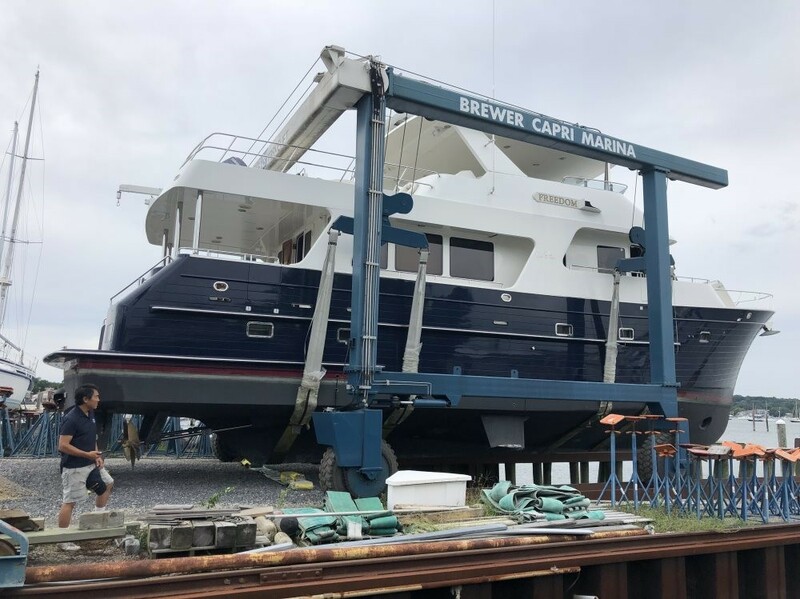 Since it was after Labor Day, there was only one other boat in the marina, and that was an electrician from the mainland working on pedestals. 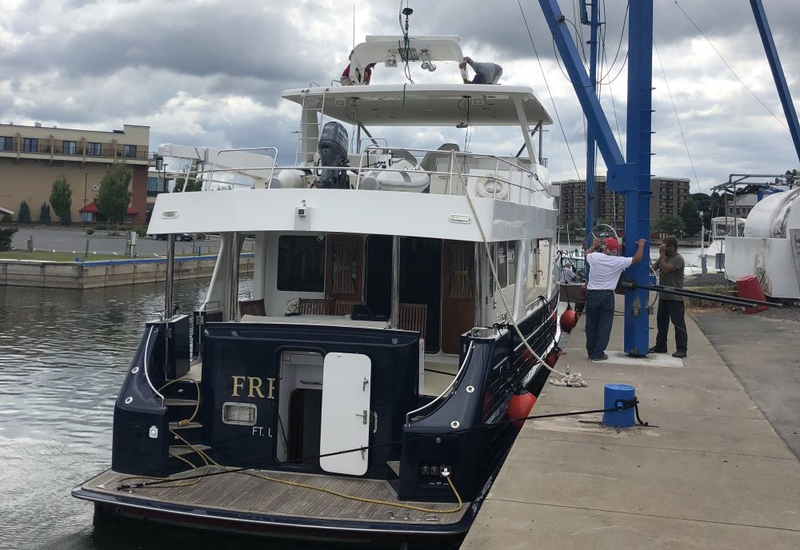 The next day, Mike and continued our trek north up the Detroit River thru downtown (no drive-by's) and ended the day in Sarnia, Ontario; across the river from Port Huron at 2200. This is home to the Dubois family with whom I delivered them and their 48 Hatteras LRC from Portsmouth NH to Algonac MI. Alpena Michigan would be our next stop. Arrived at 2300 (late arrivals seems to be a theme with us) in freshening winds. In fact, we would sit out the following day as GALE WARNINGS were up and the yacht was pinned to the dock. Mike and I took the opportunity to visit the Great Lakes National Maritime Museum (free). 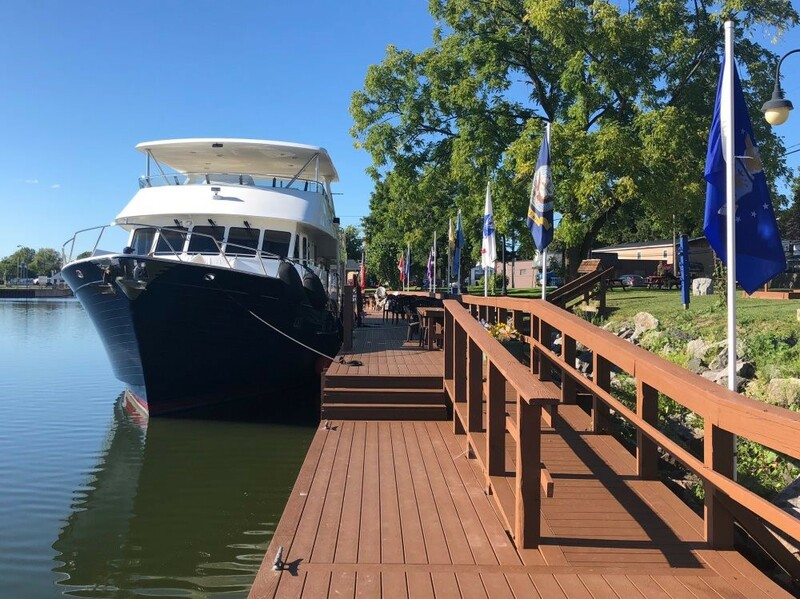 We learned about the history of boat building since the early settlement of region from the days of sail and steam power to the current maritime industry. The area around Alpena is known as The Graveyard of the Great Lakes. The day following the gale, it was like someone had turned off the fan. Continuing onward, Lake Huron was flat like a babies bottom. We took this opportunity to launch my drone and get some aerial videos which I would later edit into a nice video presentation for the owner as a thank you gift. 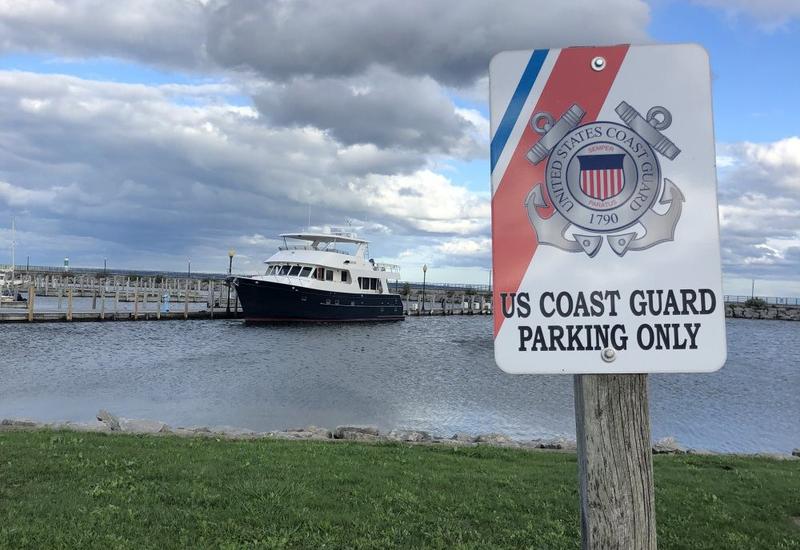 Towards the end of the day, we pulled into Mackinaw City to an empty marina. Phone calls thru the day, radio calls on approach and knocking on the office door before closing time, all went unanswered. You know what that means - FREE DOCKAGE!! For a couple of old Coast Guardsmen like Mike and I, Mackinaw City is also home to the legendary "Mighty Mack." 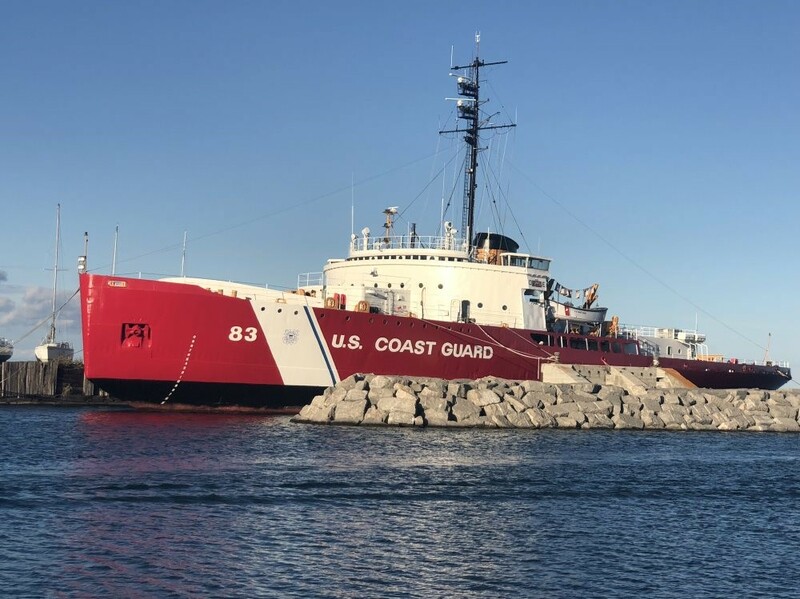 Built in Toledo, the now retired USCGC Mackinaw is a 290' icebreaker that spent it's entire 63 year career keeping the navigation lanes open on the Great Lakes. 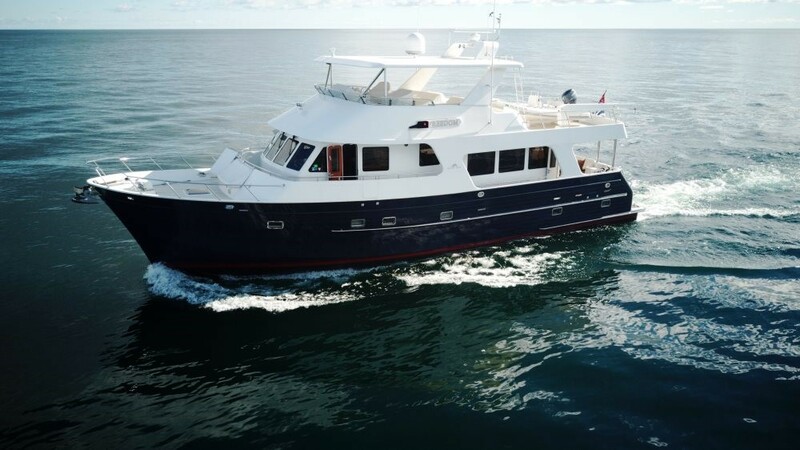 With the final leg of 160 miles, Mike and I were underway pre-dawn in the typical chop you get in the Mackinac Straight but once out in Lake Michigan, the trip around the bottom of Beaver Island and across to Rock Island Passage into Green Bay and the final run on this 16 hour leg with delightful. We arrived at Sturgeon Bay and the awaiting owner at 2230. 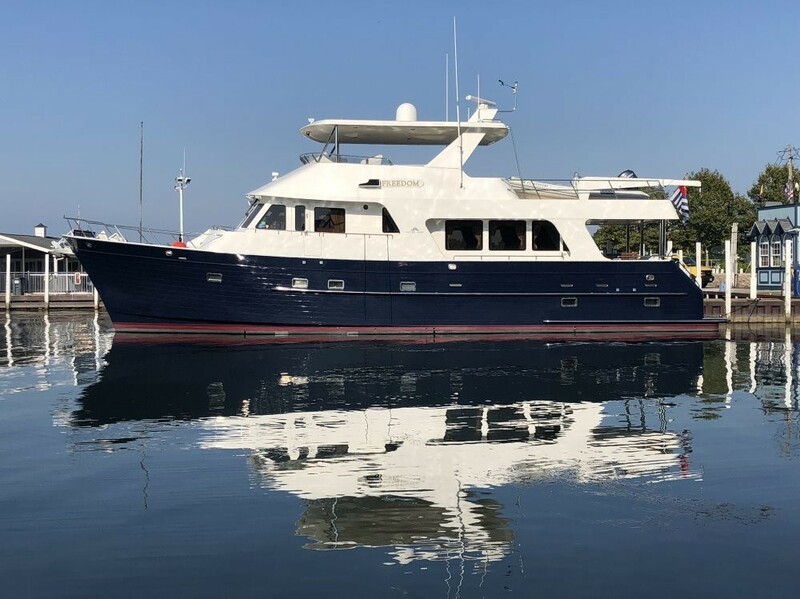 It was a squawk free delivery, which is typical for me on the Outer Reef Yachts. And it was great to once again get underway with an old shipmate.